Whether you are interested in marble fireplaces, marble door surrounds, marble kitchen hoods, marble fountains, or other marble custom features, we have plenty of options for you. Our marble is quarried and imported from France and Italy. With a variety in color, marble types and more, our experts can help you find the perfect match for your next project that fits your lifestyle and preferences. 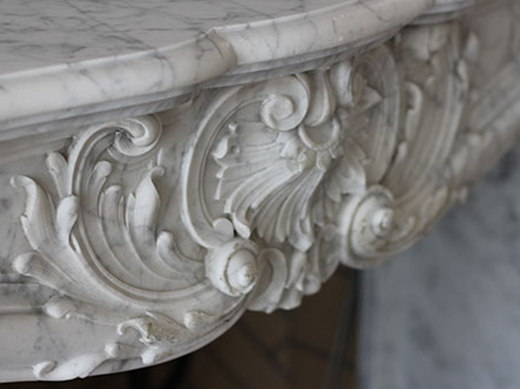 Marble is a very durable natural stone, which makes it a fantastic choice for building beautiful architectural pieces. Not only is it fire resistant and durable, it also has a classic and elegant appearance for timeless beauty. With its spectacular look, it is the perfect natural stone for numerous home features. Interested in our custom marble services? Take a look at our simple, effective process below. *Please note that we only create custom home features. We do not install them. At Impression, we are proud to be the best artisans for custom home features. With years of experience, state of the art tools, and traditional French hand carving techniques, we know how to craft superior custom home features. Don’t wait to get started on your dream project. Contact our artisans today! Take a peek at the marble options for your next project below.